Without even so much as an official launch date, there are already 10,000 WP7 devices out there. How do we know this? 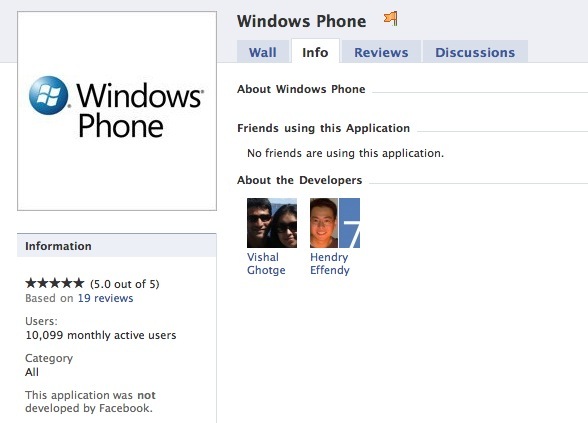 The Facebook app for WP7 has slightly more than 10,000 users, meaning there are that many installed copies of the program on handsets. Microsoft is really pushing hard to get these phones into people’s hands as early as possible, and build a significant user and development base before the phone even launches. This means that when the OS finally goes public, you’ll instantly have a robust set of applications to download and play with. Well, that’s the plan, anyway. Killer Phone! Can’t wait til November! and if you ask me it’s a great plan! testing the phone with real users in the real world.. that’s how you can make it better! Well I do have a real device and I didn’t even know about the FaceBook App… Mind you I dont have a FB account so, its likely there’s a lot more devices in the Wild, but its great to know there are so many!! !